Lisa Schroeder, Author: It's a trilogy! Yay! Congrats, Lisa--the books look fabulous together! Thanks, Sarah. It was fun to see them all together! My students will be so excited! THey look awesome together and delicious! Thanks! Tell your students HI!!! 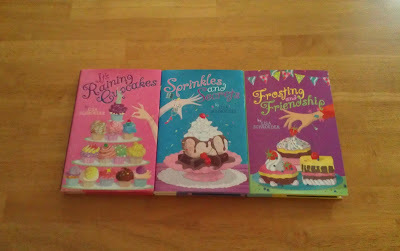 Started homeschooling and reading It's Raining Cupcakes - going to purchase the other two so I have the set to read. Do you have a mailing list to update me if there will be a fourth book in the series?